Almost forgot to post this 576 that matches the made-in-UK Gimme 5 collab with the velcro N we saw previously. This time London’s Foot Patrol sneaker boutique is on the buttons. The preview shows a reddish-brown upper with brightly colored, removable, velcro Ns in blue, orange and yellow. 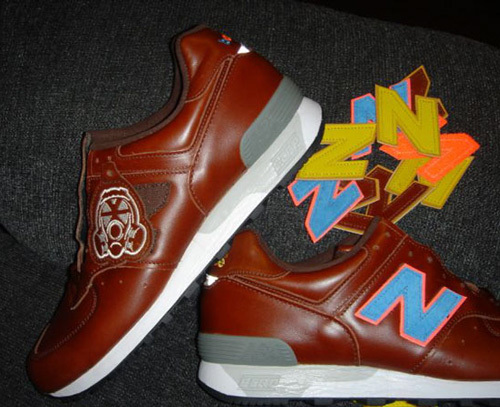 Each shoe also comes with a leather tag bearing the logo of the shop that collaborated with New Balance, in this case a Foot Patrol gas mask. No word on release dates yet. Via HB. Thanks Xymon for the heads up. This entry was posted on Thursday, June 28th, 2007 at 3:12 am and is filed under 576, Limited, UK. You can follow any responses to this entry through the RSS 2.0 feed. You can leave a response, or trackback from your own site. Switching the N to the gas mask looks ill. Gives a whole another, sleeker look to the shoe.